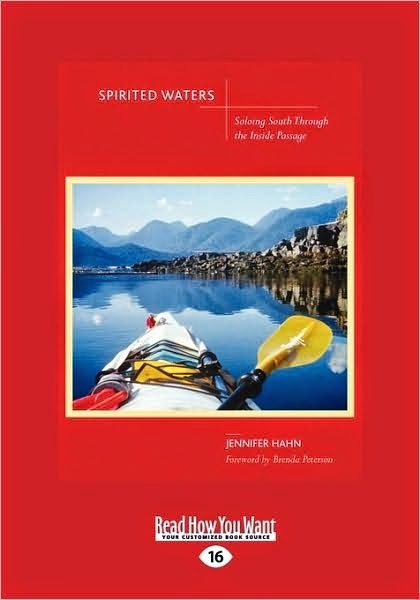 Spirited Waters: Soloing South Through the Inside Passage, by Jennifer Hahn (pub by Mountaineers Books, Seattle, WA, 2001, 211pp.) Winner of the Barbara Savage Memorial Miles From Nowhere Award. The passage was from Ketchikan, Alaska, to Bellingham, Washington. For a naturalist who had worked for fourteen years as a kayaking guide, this trip was a logical evolution. It is not a night one, night two, night three kind of trip log, but a sensory experience for the reader. The author takes you through the non-stop challenge from large, foam-crested waves, strong currents, huge tides, up-wellings, whirlpools, wolves, and being surrounded by killer and gray whales, eagles, sea otters, etc. She shares the experience of spending a couple days with a dying breed, a family of lighthouse keepers. Then she is adopted for a night by a family of loggers. Throughout the books she adds the customs and beliefs of the First Nations people that have called this coast home for thousands of years. As a naturalist, she also introduces the reader to the continuous living grocery full of delicacies that lie in the tidal zone or just below the surface. Her meals are enriched with a wide range of seaweeds, kelps, sea urchins, crabs, clams and many other creatures that add to her chowders. While this can never be a trip taken for granted, she is honest about the doubts and fears that any paddler should expect to face on such a coast where nature is still wild, and support or assistance is unlikely to be available, or not likely to arrive before it’s too late. Beyond those fears facing any paddler, she adds those of particular concern to a woman traveling along in such a wild environment. Male or female, this is a book any paddler will enjoy.